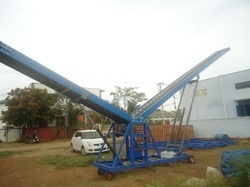 Prominent & Leading Exporter from Coimbatore, we offer radial stacker conveyors, bag stackers conveyor and bag loader and unloader. The Radial Tracked Stockpiler Series is a unique concept to the marketplace. Essentially it is a Radial Wheeled Stockpiler and Tracked Stockpiler all-in-one! 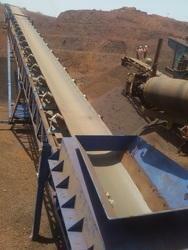 The remote control track system is used to move the machine around site including rough terrain. It is also of benefit when re-locating the machine to a different site as it can easily be tracked onto a low loader or Low-Boy. When the machine has been positioned for work using the Tracks, the Radial Tracked Stacker can produce a 360° stockpile. By engaging (via remote control) the wheel drive system, the operator can remotely radial the RTS Series either clockwise or ant-clockwise to create a 360° stockpile. The Automatic angle adjustment allows the machine to increase the angle of the machine as the stockpile below increases. · Can be used to create numerous stockpiles of different materials. To match up the varying demands of the clients, we are engaged in offering extensive array of Bag Stackers Conveyor to our valuable customer. All our offered range of products has been made using the best technology. Our offered range of Bag Stackers Conveyor is excellent in quality and well tested on different quality parameters. They have been priced at very reasonable rates in the market and are available as per the demands of our customers. We have always given extra fine finishing to our final product range. To match up the varying demands of the clients, we are engaged in offering extensive array of Bag Loader and UnloaderConveyor to our valuable customer. All our offered range of products has been made using the best technology. Our offered range of Bag Loader and Unloader Conveyor is excellent in quality and well tested on different quality parameters. They have been priced at very reasonable rates in the market and are available as per the demands of our customers. We have always given extra fine finishing to our final product range. 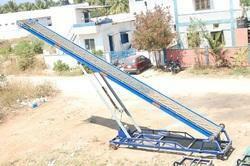 Looking for Portable Radial Stacker Conveyor ?